Are you enjoying the nice weather and cooler temperatures of early autumn? Niwashyu staff Anika is enjoying it to its fullest! When not working on new design projects, I am working with all my might on new eBooks for Real Japanese Gardens. Until next year, my goal is to complete all our guides to Tokyo’s gardens! Recently we published the guide about famous Koishikawa Korakuen. Hamarikyu is soon to come and Rikugien will follow soon after. Now is the perfect time to visit gardens in peace before the buzzling time of autumn foliage start. Maybe with one of our guides? 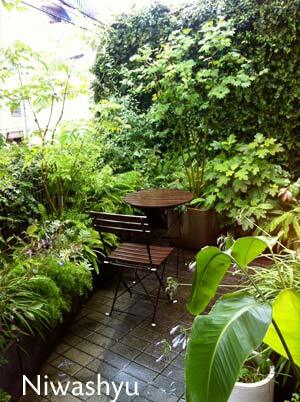 While doing the research, I am enjoying our green terrace with a Cafe Latte. As a real German, I am totally addicted to coffee! In my free time, I am now enjoying visiting Japanese Gardens, old temples and shrines, the mountains nd studying the art of real Japanese Gardens. One month ago, Niwashyu staff Anika attended a class about container design. It was held by Gabriele Kubo of Flower Design School Hana-Ami at the Flagstore of Youkaen in Sakurashinmachi. The participants learned the basics of design principles and how to pot the plants together into a planter. 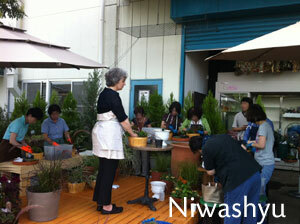 I as a gardener already knew the basics, but was fascinated by how Gabriele hold the class. She is a strict teacher, but one really learns a lot, when listening well. Her combined knowledge of German and Japanese design, can widen one’s horizon. If you are interested in Flower design, please visit the website of Hana-Ami School. Classes are held in Japanese, but Gabriele is also fluent in English and German. I am often designing planters for private use or for customers. There are some great differences in using planters, I want to write about today. First of all, there are two styles of container design. If you integrate big planters into your balcony design, you might want them to look great in all seasons and also to have them look good for a long time. The other possibility for planters is a seasonal planter. These ones most often happen to be small but stylish pots with perennials or annuals, which are flowering for one season. Winter arrangement done by me. 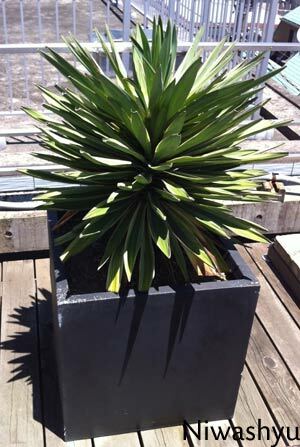 When designing a planter of the first style, there are again some possibilities how doing the design. Always consider the surroundings. Sometimes, one single tree or symbol plant is doing well without anything else. 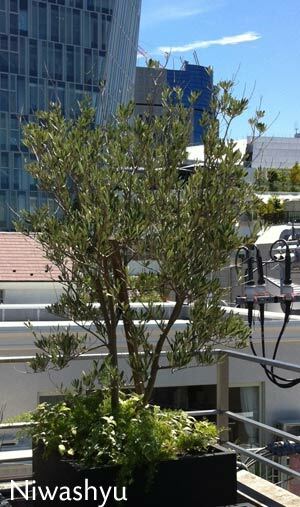 A single plant in a container. No need for more. Sometimes, you want to combine a tree or special plant with smaller perennials, evergreens or ground covers. And sometimes, you want a flower bed in pots. 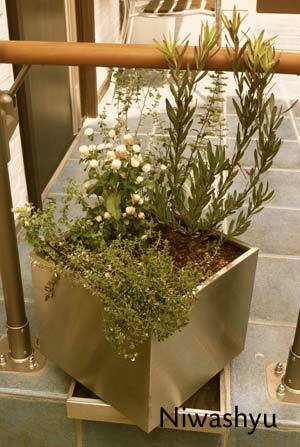 Herb garden in a pot. It might be not beautiful in every season. Always think about the seasons! If you plant a deciduous tree, you might want some evergreen plants to its feet in winter. When designing a flower bed in pots, you should think about the flowering times of each plant. Choose one or more for every season and combine them with some evergreens. This kind of planter design is the most difficult one. It’s not only about flowering time, but also about shape, colour, height and sense! A very maintenance intensive design. The second design style is comparable with the above mentioned flower bed in pots. 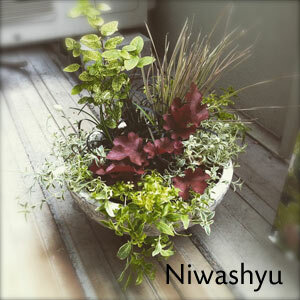 You have to create a planter, which is interesting and looks good. The colours have to fit, the plants should have different heights and the leaves different shapes. A good way to choose plants for these designs is, to go to a plant shop, selecting plants and put them into your basket in the way you would like to plant it later. You can already guess how it could look like. 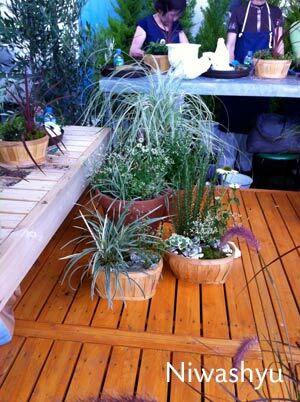 Garden centers should also have example planters, where you can borrow ideas. Please be aware, that this arrangements are not meant to look nice for a long time! It already looked totally different only one month after planted. And they definitely need more maintenance than the above mentioned planters. Of course you can choose evergreen plants too, but perennials, annuals or flowering plants may need to be exchanged during the seasons. You will need to cut off old flowers and resize evergreens regularly. Also old and dead leaves have to be removed. When maintained in the right way, this arrangement can be enjoyed all year round. Plants are living things. There are fast- and slow growing plants, but they all evolve. They will never look always the same. 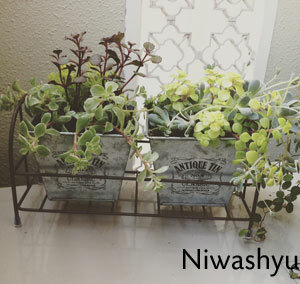 To have a great garden, balcony or planter, one has to do maintenance on a regular basis, to keep plants in shape. There is no „no maintenance“ garden when plants are involved. This is one basic rule, one should never forget. A green terrace, which needs regular maintenance. Picture before maintenance. In November I finished my first project for Niwashu. 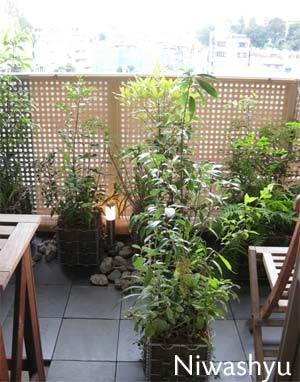 We reformed a huge garden in Tokyo's Minato-ku over one week. When we first arrived in the garden, it was like a high green wall in the background and empty space in the foreground. The new garden is a mixture of European elements and modern Japanese style. The European elements are presented by creating a garden through plants and the Japanese style through the gravel areas and the small terrace in the middle of the flowerbed. We wish everybody a Happy New Year 2015! There happened a lot in late 2014 and I will be happy to write about it when I'm not so busy like now. I hope, this year will be as much fun as the last. May 2015 be a prosperous, healthy and happy year for you! Yesterday, Niwashyu team went to a award ceremony of YKKap Exterior. 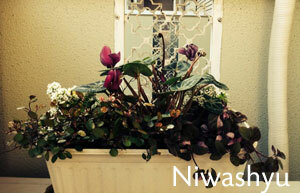 There was a photo contest where Niwashyu also submitted designs an won two prices. One was a bronze award for entrance areas and one was silver award for reforming a present exterior space. I hope I will someday also be able to went up to the stage and receive a price! Thank you and bye bye!